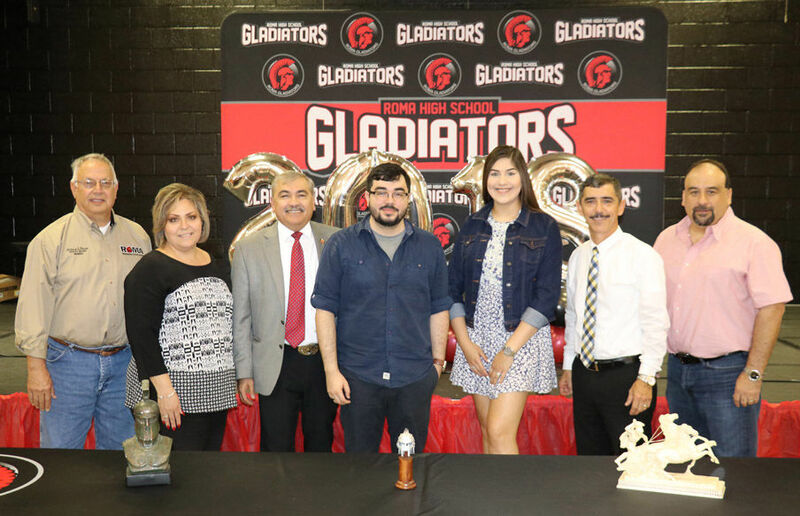 Roma High School alums Alejandro Guzman and Leslie Puente were honored with the unveiling of State Champion UIL Banners in their honor at the high school. The banners, which now hang in the school cafeteria, will serve as a continual reminder and incentive to current and future UIL academic competitors, the school district said. Guzman was the UIL State Champion in Computer Applications in 2012 and Puente was the UIL State Champion in Headline Writing in 2016. “I want to thank our alums that we honored because you have set a high bar for all academic UIL students at Roma ISD,” said Roma ISD School Board President Raul P. Moreno Jr. “We thank you for your effort and know that everyone will continue to remember your accomplishments as proud Gladiators for many years to come. Both Guzman and Puente spoke with the Roma High School UIL Academic Program students in attendance, encouraging them to never lose sight of their goals. They both spoke about the importance of the program in their academic development. Students from Roma High School were also highlighted at the event to celebrate a stellar year in competition, culminating in four state qualifying students.